Everyone has seen the news stories about how Representative Paul Ryan, the leading candidate to be the next Speaker of the House, is a budget wonk. That should make everyone feel good, since we would all like to think a person in this position understands the ins and outs of the federal budget. But instead of telling us about how much Ryan knows about the budget (an issue on which reporters actually don't have insight), how about telling us what Ryan says about the budget? It is possible to say things about what Ryan says, since he has said a lot on this topic and some of it is very clear. In addition to wanting to privatize both Social Security and Medicare, Ryan has indicated that he essentially wants to shut down the federal government in the sense of taking away all of the money for the non-military portion of the budget. This number is roughly equal to current spending on the military. 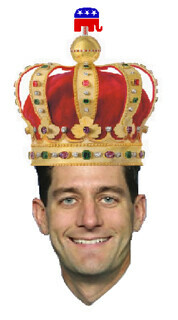 Ryan has indicated that he does not want to see the military budget cut to any substantial degree. That leaves no money for the Food and Drug Administration, the National Institutes of Health, The Justice Department, infrastructure spending or anything else. Following Ryan's plan, in 35 years we would have nothing left over after paying for the military. Just to be clear, this was not some offhanded gaffe where Ryan might have misspoke. He supervised the CBO analysis. CBO doesn't write-down numbers in a dark corner and then throw them up on their website to embarrass powerful members of Congress. As the document makes clear, they consulted with Ryan in writing the analysis to make sure that they were accurately capturing his program. So what percent of people in this country know that the next Speaker of the House would like to permanently shut down most of the government? What percent even of elite educated policy types even know this fact? My guess is almost no one, we just know he is a policy wonk.